West Hempstead High School boys varsity basketball program held its annual “Hoops for Hope” charity game against Hewlett High School on Dec. 12. The team raised $800 to be donated to SIBSPlace. SIBSPlace is a free program serving children between the ages of 5-17 that live with a sibling with cancer or another illness or a parent with cancer. An affiliate of South Nassau Communities Hospital, the program focuses the attention of the challenges well siblings face in coping with their emotional response to the medical diagnosis of a loved one. The boys basketball program raised money through T-shirt ads, concession sales and donations in addition to the T-shirts that were sold at the game. Both teams were presented with certificates of appreciation from SIBSPlace representatives during the Dec. 12 game. 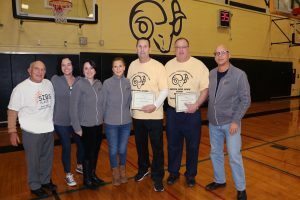 Representatives of SIBSPlace presented the West Hempstead High School and Hewlett High School boys varsity basketball teams with certificates of appreciation on Dec. 12. 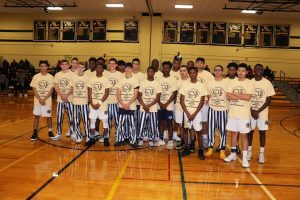 Members of the West Hempstead High School and Hewlett High School boys varsity basketball teams wore T-shirts for SIBSPlace during a “Hoops for Hope” charity games on Dec. 12.